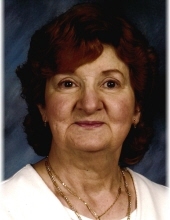 Rita Ruzzi, 77, of Batavia passed away peacefully on Thursday April 4, 2019 at the Kirkhaven Transitional Care in Rochester. She was born on November 13, 1941 in Batavia to the late Frank and Marie (Marchese) Ruzzi. In addition to her parents, Rita is predeceased by her siblings; Joseph, Michael Ruzzi, Rose Ruta and Margaret Stefani. Rita was a longtime member of Ascension Parish. She worked for many years at Melton Shirt Company and Batavia Downs. She is survived by her sisters; Shirley (Richard) Neth of Batavia, Jennie Dawson of Rochester and Audrey Prouty of Rochester, beloved nephew Richard (Melanie) Stefani of Batavia, along with many nieces and nephews. There will be no prior calling hours. A 10:00AM Mass of Christian Burial will be held on Monday April 8, 2019 at Ascension Parish 15 Sumner St. Batavia, NY 14020. Rita will be laid to rest in St. Joseph’s Cemetery. In lieu of flowers, memorials may be made to Alzheimer’s Association at www.alz.org or in the form of Masses. For more information please call 585-343-8260 or to leave a message of condolence please visit www.gilmartinfuneralhome.com. Arrangements completed by Gilmartin Funeral Home & Cremation Company, Inc. 329-333 West Main Street Batavia, New York 14020. To send flowers or a remembrance gift to the family of Rita Ruzzi, please visit our Tribute Store. Or in the form of Masses. "Email Address" would like to share the life celebration of Rita Ruzzi. Click on the "link" to go to share a favorite memory or leave a condolence message for the family.